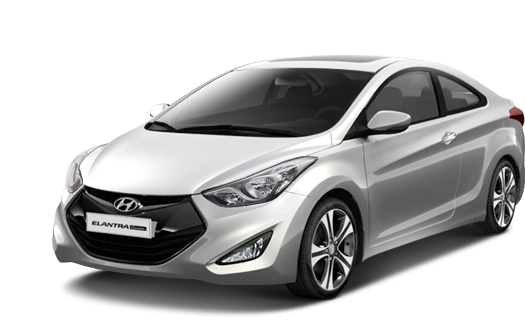 Hyundai Elantra Coupe | HYUNDAI - NEW THINKING. NEW POSSIBILITIES. 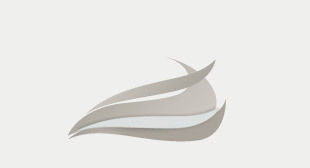 The Elantra Coupe features a "wind craft" design inspired by nature's fault lines and dynamic waves. INTERIORThe Elantra Coupe sets new standards in interior design, proving once again why leadership in compact car design has been the foundation of Hyundai's reputation. PERFORMANCEElantra Coupe engines and transmissions boast major engineering improvements. They’re made of lightweight aluminum and incorporate such exotic new technologies as Continuously Variable Valve Timing for minimal fuel consumption and emissions and more power. SAFETYHyundai engineers were uncompromising in designing the Elantra Coupe's active and passive safety systems. CONVENIENCEA private oasis of comfort and relaxation, the Elantra Coupe offers every amenity and convenience you'd expect. fitted with LED side repeaters providing a crowning touch. The Elantra Coupe comes with a choice of distinctive and eye-catching wheels. Elantra Coupe offers standard 15“ and optional 16“ and 17“ alloy wheels. 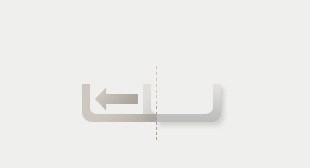 It helps the vehicle stay in the course while reducing drag and increasing furl economy. Check out the exciting new palette of colours for the Elantra Coupe. Smart and sophisticated, each shade has been carefully researched and tested for universal appeal, so you can be sure your choice is perfectly in synch with the times. of 18.2 kg·m is reached at 4,700rpm. Australia exception.Engine performance might differ by regions. 6-speed automatic transmission that saves more fuel Six is better than five as the extra gear boosts fuel economy. 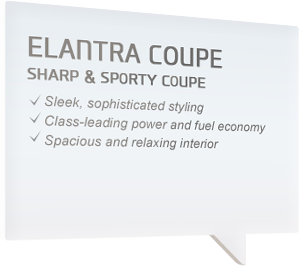 Elantra Coupe’s six-speed automatic transmission is specially developed for the compact car. And like Hyundai engines it is made in-house, which further proves Hyundai’s highly advanced engineering capabilities. The Eco-driving indicator embedded in the instrument panel helps romote thriftier driving habits, flashing red when you are wasting fuel and green when you are conserving fuel. 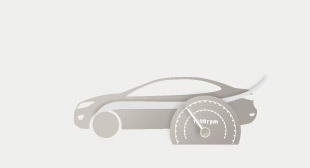 Standard silica tires reduce rolling resistance and help to further reduce your fuel bill. A Vehicle Stability Management system takes safety to the next level by combining the intelligence of Electronic Stability Program (ESP) with Motor Driven Power Steering (MDPS) to avoid loss of control which can be caused when sudden braking or rapid accelerating under asymmetric (wet/dry) road surface conditions. The system completely operates automatically without requiring any input from the driver. Elantra Coupe comes with six airbags: dual front airbags for the driver and passenger plus dual front seat mounted airbags and dual side curtain airbags which offer additional protection against side impacts. an extra measure of pleasure to driving. Auto cruise control switch Confortable, pedal-free driving is accessible through illuminated buttons. Audio control switch Steering wheel audio buttons Include volume, radio tuning and a high-low control tumbler switch. With iPod, auxiliary and USB input ports, Elantra Coupe offers full connectivity for the most popular types of personal music players as well as mobile phones. Take you personal playlist with you: The world of sound is right at your fingertips. Elantra Coupe accepts USB, iPod and auxiliary device inputs, so simply plug in your favourite device and enjoy. Happiness is gripping Elantra Coupe's warm steering wheel on a freezing winter day. A new feature that is certain to be much appreciated in the colder climes of our planet.